I have questions relating to the information you provided. I am pleased that the Council is pursuing concerns over school signage with the NSW State Government, however I believe the Council had success previously when approaching Chatswood Public School over this matter. In the case of the scrolling bright sign outside Chatswood Intensive English School, can I ask that the voiced concerns of a number of residents be addressed by a direct approach to the school? I am convinced that this matter should not require a direct approach to the Education Department, but if it should, will Council act in this regard? Please note that Chatswood IEC has a separate Principal to Chatswood High School. Can you outline the circumstances in which the Meriton sign was approved as it sets a disturbing precedent as well as being kept on for excessive hours through the night? Can you clarify if Council still maintains its policy of preventing west facing illuminated signs on high rise buildings within Chatswood CBD? Can this decision be overturned? Why was ‘Exempt Development’ approval given to the original sign in the light of a complaint being made? This seems to be the very opposite of the intention of Council’s regulations. However, my complaint refers to a sign which is more recent, larger, brighter and more animated and replaces the one of August 2013 which received apparent sanction. The original sign which prompted my concerns two years ago was smaller and less insistent than the present one. The sign erected now is a new one and clearly breaches Council’s regulations in a most serious way by distracting driver’s attentions at a site of serious accidents. Would you kindly forward the stipulations required to be made to the sign to ‘achieve compliance’ as it is now more prominent than the earlier one? Thank you for this further information and your informative explanations. The Meriton sign, which as I have argued sets a troubling precedent in being the first west-facing illuminated sign, seems to fail if argued as necessary to allow this building to be “located by visitors to Chatswood”. It is on the wrong side of the building from the transport interchange. Was Meriton and the Dept Planning and environment made aware of Council’s long standing policy regarding west facing high rise signage? The sign is bright and a dramatic intrusion into the residences it beams down onto. As well it runs down the face of the building for many stories rather than being positioned as identification signage at the top as with all other high rise signs. At present it is illuminated 24 hours a day. Other signage is switched off before midnight. Is this not in breach of Council rules regarding illuminated signage on buildings? Thank you in anticipation of your efforts in this matter. I recognise the limitations in relation to school properties. 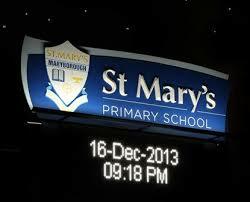 In this regard Council achieved positive outcomes last year in dialog with the Primary school sign whose sign was made static, however this has recently been breached by the school. This is a distraction to drivers in the narrow congested lanes immediately in front of this animated signage. the patterns changes regularly but has in the past used flashing full screen colourful images and scrolling text. Incidentally, a school principal informs me that the DOE has recently issued revised requirements and all such signage must now be submitted to Councils on behalf of the DOE. Perhaps this is a possible further line of enquiry? This is an important matter for the wider municipality as animated digital signage companies are actively promoting this new technology directly to schools. The sign is now the third one on these premises, is very recent and I believe has replaced the one you referred to which had received earlier Council approval. I believe it breaches the original Council stipulations in being larger, brighter and more animated. My concern here is not merely aesthetic. I remain persuaded that it poses a serious accident risk to distracted drivers negotiating this dangerous intersection. Cars regularly proceed through the second set of red lights, as they do not expect a double set of unmatched lights turning right from Albert north to the Pacific Highway.